Fire pit tables represent not just a great source for heat on a chilly evening, but also a beautiful centerpiece for your patio or garden. They make you feel the ambiance of cottage life right at home, while enjoying the warmth and all the other pleasures that come with an open fire. ​There is a multitude of fire pit table brands and models. So, if you have decided to get a fire pit table, you are probably having a hard time choosing which to get. 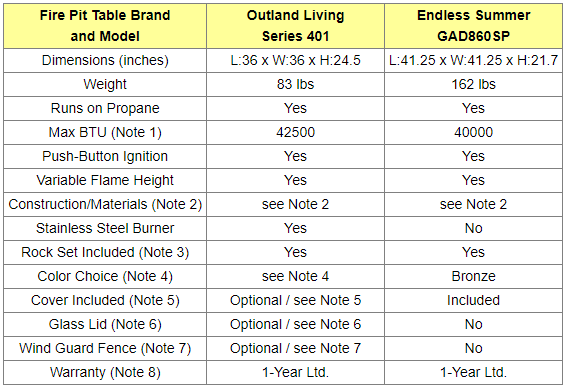 To help you select a quality product that will make you happy, we will compare here two of the most popular and best rated fire pit tables bought by Amazon customers: Outland Living Series 410 and Endless Summer GAD860SP. Indeed, at the time this article was written, these two had received the best average ratings from Amazon customers: 5 stars for the Outland Living and 4 stars for the Endless Summer!. Important Note: When you purchase a fire pit table, to avoid accidents, before use, ALWAYS refer to the owner’s manual for all warnings, safety information, operating instructions, care instructions and troubleshooting. 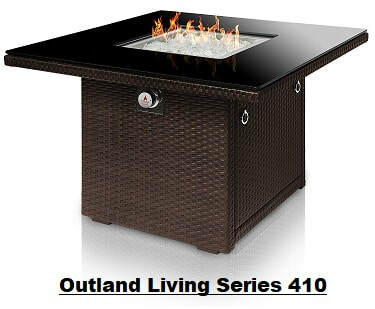 This article will compare Outland Living Series 410 and Endless Summer GAD860SP patio/garden fire pit tables. BTU stand for British Thermal Unit which is a traditional unit of heat. It is defined as the amount of heat required to raise the temperature of one pound of water by one-degree Fahrenheit. The Outland Living fire pit table has a powder coated aluminum frame construction with a resin wicker base. It features an 8mm black tempered glass tabletop. The housing of the Endless Summer fire pit table is made of steel. It features a multi-colored slate and marble mosaic tile mantel. With the Outland Living fire pit table, Arctic Ice decorative glass rock set is included. With the Endless Summer fire pit table, both lava rocks and logs are included. Outland Living fire pit table comes in espresso brown or slate gray. Endless Summer fire pit table is bronze colored. The optional Outland Living durable black UV & water resistant cover offers tapered fit, elasticized bottom band, and breathable venting with mesh barriers (see Amazon products section for the kit that includes the table cover). The optional 8 mm tempered clear glass lid insert, with convenient chrome pull ring, fits flush to transform the Outland Living fire pit table into full service table (see Amazon products section below for the kit that includes the glass lid insert). The optional 8 mm tempered clear glass wind fence that can be obtained for the Outland Living fire pit table provides a heat resistant safety barrier with polished edges to shelter the flames from wind (see Amazon products section below for the kit that includes the glass wind fence). The warranties apply for residential (not commercial) use. So which of these two fire pit tables to buy? The Outland Living fire pit table is slightly smaller and lighter. Yet, it generates more heat (42500 BTU as opposed to 40000 BTU for the Endless Summer fire pit table). The Outland Living fire pit table is equipped with a stainless-steel burner, while the Endless Summer table has a cast iron burner. Clearly, a stainless-steel burner will last longer, and there will never be any rust, even if it is not always covered when not used. 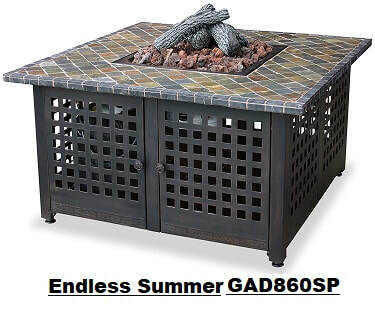 However, the Endless Summer fire pit table comes with a cover included, and as long it is covered when not used and protected from rain and humidity, it should also last a long time. ​No cover is included with the Outland Living fire pit table. But a cover is optionally available if needed (see Amazon product sections below for the kit that includes the table cover). For the Outland Living fire pit table, if desired, you can also optionally obtain a glass lid insert as well as a glass wind guard fence (see Amazon product sections below for the kit that includes the table cover). The Outland Living fire pit table will add beauty and warmth to your patio, deck, poolside, or other outdoor living space. You will admire the reflection of the dancing flames on the Arctic Ice fire glass and black tempered glass tabletop, while keeping warm and cozy within the heating radius of this impressive outdoor centerpiece. The 42500 BTU propane fire table can conveniently conceal a standard propane tank within its base. You can easily access the interior compartment to switch out the propane tank on either side through user friendly access doors with chrome pull rings. The espresso brown resin wicker base of the fire table will compliment other patio furniture and accessories to offer a unified outdoor living space. Relax and entertain outdoors with family and friends all year round with the superior Outland Living fire pit table. Never worry about the weather: drainage holes in the stainless-steel burner pan allow the rain to drain away, and the optional glass lid insert as well as glass wind guard fence protects the flames. Alternately, if you can consider the Endless Summer fire pit table, you will bring the warmth and ambience of a fireplace to your patio, deck or backyard. Featuring a slate mosaic tile mantel, this fire pit is complete with a decorative base, that can cleverly conceal the propane tank and control panel, making it an attractive centerpiece for your outdoor living space. Complete with a 40,000 BTU cast iron burner, you can enjoy all the ambiance of a classic fire, without the mess of tending ashes. Adding to the elegance, this unit comes with both lava rock and logs, which beautifully accents its flames. Please click the fire pit table of your choice below for price information or to purchase. ​Have you still not found yet what you were looking for?